Sofa, the software company behind Mac apps like Versions and Checkout, on Tuesday unveiled Kaleidoscope, a file-comparison utility. Kaleidoscope lets you easily review differences between multiple versions of a file. If you need to spot the changes from one revision of a text document to the next—a common need for software developers using source control tools like Subversion or Git—the app can quickly display a color-coded side-by-side comparison. Tracking image changes presents an even slicker interface: You can look at different versions of the image side-by-side, or even view a unique split-screen presentation that lets you pan back and forth at any angle to reveal where the two images differ. 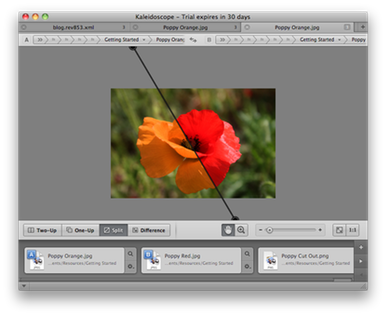 Kaleidoscope also lets you compare image files. The app works with Photoshop documents, along with numerous other popular image formats like JPEG and PNG, and with text documents as well. Kaleidoscope is available for download now with a free 30-day trial and requires an Intel Mac running either Mac OS 10.5.8 or later or 10.6.2 or later. A full license costs €29—about $36 US.